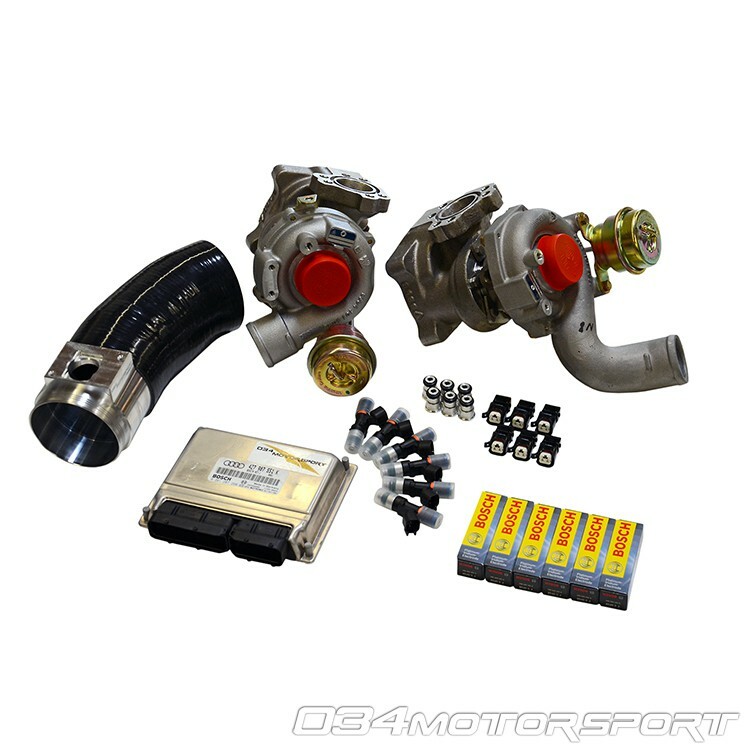 034Motorsport is proud to offer our complete Stage 3 Turbo Kit for the B5 Audi S4 and C5 Audi A6 & Allroad! While capable of doubling the stock 2.7T's output, this turbo kit does not sacrifice the smooth power delivery and factory driveability. This 2.7T Stage 3 Turbo Kit is centered around a pair of Genuine Borg Warner Audi RS4 K04 Turbochargers, and includes only the highest quality supporting components designed, manufactured, and tested by 034Motorsport. The 034Motorsport 2.7T Stage 3 ECU Upgrade uses the latest generation of Bosch EV14 550cc Fuel Injectors, as well as the updated Hitachi 2.7T MAF Sensor to ensure adequate fueling and proper air metering. 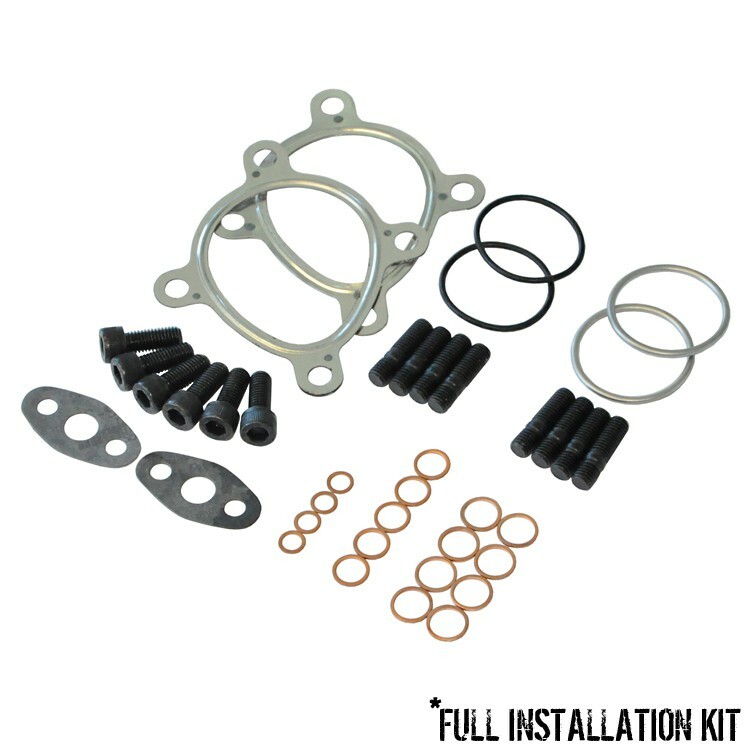 The ECU upgrade for this kit was developed in-house at 034Motorsport on our chassis dynamometer, and thoroughly tested on the dyno, street, and track to ensure optimal performance, safety, and reliability. 034Motorsport is proud to offer our complete Stage 3 Turbo Kit for the B5 Audi S4 and C5 Audi A6 & Allroad! While capable of doubling the stock 2.7T's output, this turbo kit does not sacrifice the smooth power delivery and factory driveability. 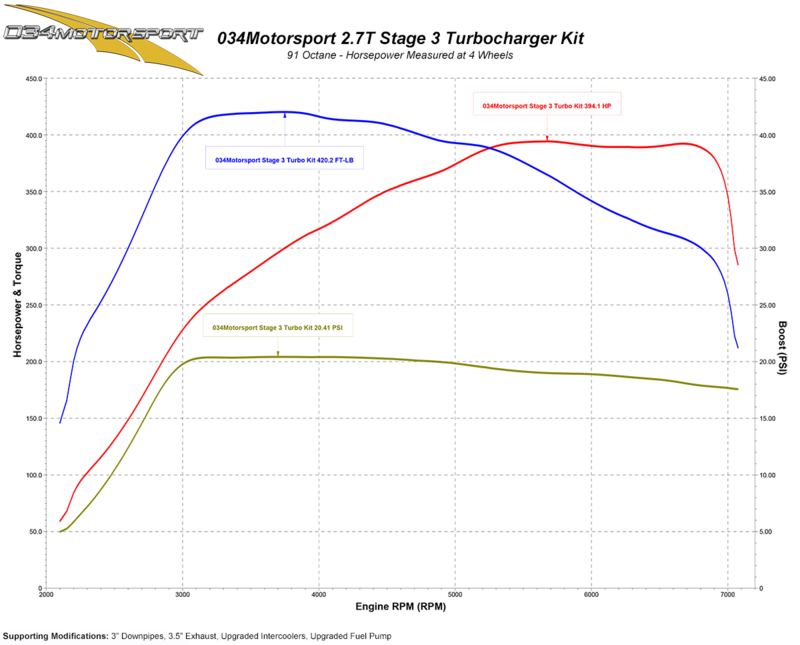 This 2.7T Stage 3 Turbo Kit is centered around a pair of Genuine Borg Warner Audi RS4 K04 Turbochargers, and includes only the highest quality supporting components designed, manufactured, and tested by 034Motorsport. The 034Motorsport 2.7T Stage 3 ECU Upgrade uses the latest generation of Bosch EV14 550cc Fuel Injectors, as well as the updated Hitachi 2.7T MAF Sensor to ensure adequate fueling and proper air metering. The ECU upgrade for this kit was developed in-house at 034Motorsport on our chassis dynamometer, and thoroughly tested on the dyno, street, and track to ensure optimal performance, safety, and reliability. The 034Motorsport Stage 3 ECU Upgrade retains full electronic boost control via the stock N75 valve. The secondary oxygen sensors and EGT sensors can be coded out as desired. 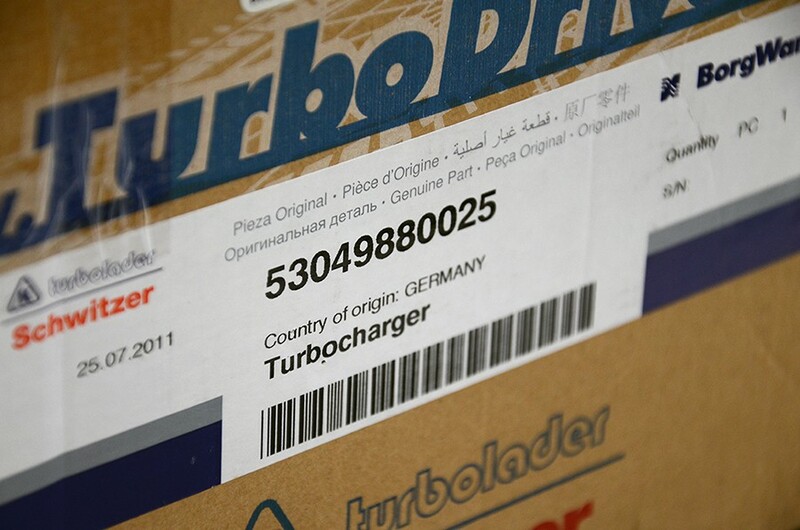 Genuine Borg Warner Turbochargers - Made in Germany! Tuning Available for 91 Octane, 93 Octane, 100 Octane, and WMI - Now Available with Multiple Tunes Via Optional 034Motorsport PL34 Handheld Flash Loader! 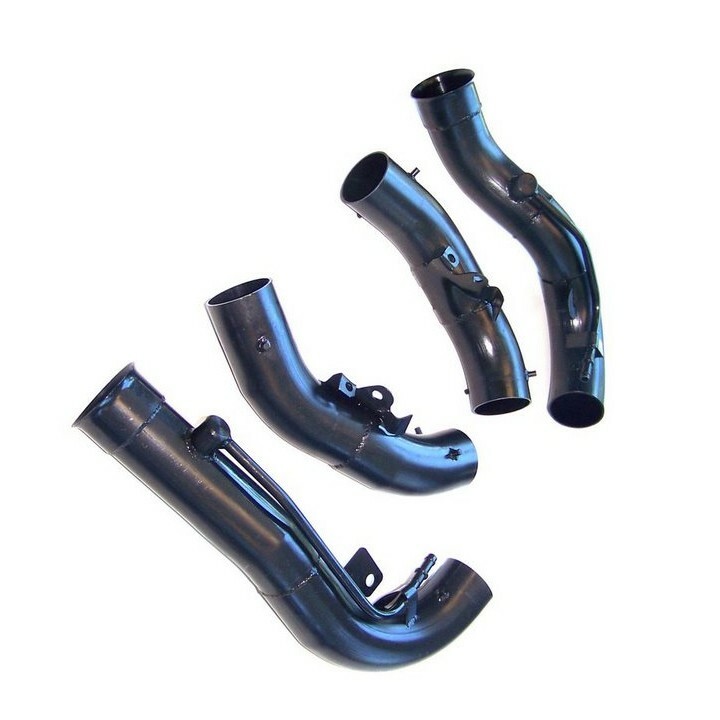 Please Note: Select whether you are using an S4 Airbox, RS4 Airbox, or Cold Air Intake below. Select your engine code (APB or BEL) below. The BEL engine will require aftermarket or stock downpipes from an APB engine. Also the BEL ECU application can vary, though we have an off-the-shelf tune for the BEL, if your ECU tune has boost control, surging and fueling issues, then you'll require a custom tune which we will need to charge an extra fee for. Please contact us if you have a BEL to discuss this further, our tuning for the APB is comprehensive. Please Note: If your vehicle is an early 2000 model with a Bosch MAF Sensor, it will need to be converted to the later Hitachi MAF Sensor. You can use our Plug in 2.7T Bosch to Hitachi MAF Sensor Conversion Kit for this.